Reasoning is one of the most important sections in a Competitive exam. You can score a great marks in competitive exams, if you get a good score in Reasoning test. This can be achieve only if you have a very good reasoning skills. Basically reasoning is divided into few sections according to logic and type. This Direction Sense Test topic is one of them. The Concept behind the Directions is same that we use in our day to day life. This direction sense test is nothing but a precise of sensing the direction. To solve the direction sense test first you need to make a sketch of the data provided. We have clearly described the direction Sense test Tricks, tips and Shortcut here. 1. At the time of sunrise if a man stands facing the east, his shadow will be towards west. 2. At the time of sunset the shadow of an object is always in the east. 3. If a man stands facing the North, at the time of sunrise his shadow will be towards his left and at the time of sunset it will be towards his right. 4. At 12:00 noon, the rays of the sun are vertically downward hence there will be no shadow. In your reasoning exam, few questions will definitely come from this topic. Here in this page we will discuss Direction Sense Test reasoning with solution which will help you to solve Logical Sequence of Words questions very easily and quickly. LearnFrenzy provides you lots of fully solved Direction Sense Test Questions and Answers with explanation. 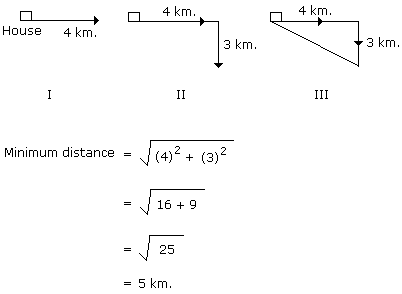 Question: A man walks 5 km toward south and then turns to the right. After walking 3 km he turns to the left and walks 5 km. Now in which direction is he from the starting place? As we may see from the figure, the man is finally South-West from the starting point. Thus, the correct answer is D.
Question: Ravi left home and cycled 10 km towards South, then turned right and cycled 5 km and then again turned right and cycled 10 km. After this he turned left and cycled 10 km to reach home. How many kilometers will he have to cycle to reach his home straight? Required distance = (5 + 10) km = 15 km. Question: 8 trees: mango, guava, papaya, pomegranate, lemon, banana, raspberry and apple are in two rows of 4 in each facing North and South. Lemon is between mango and apple but just opposite to guava. Banana is at one end of a line and is to the right of guava tree. Raspberry tree which at one end of a line, is just diagonally opposite to mango tree. Which tree is just opposite to banana tree? C. Papaya D. Data is inadequate. Filling Banana first at one end, and Guava to its left, we can find the corresponding position for Lemon, i.e., opposite to Guava. On the sides of Lemon are Apple and Mango. Raspberry is at an end, being diagonally opposite to Mango. Thus, Mango is at the end next to lemon. This, determines the position of Apple and Raspberry as well. The empty positions can be occupied by Papaya or Pomegranate. We see that Mango is just opposite to Mango. So the answer is A. Question: Based on the data given above, which tree is just opposite to raspberry tree? We can see that either papaya or pomegranate is next to Raspberry. The answer is C.
Jhon starting from his house, goes 5 km in the East, then he turns to his left and goes 4 km. Finally he turns to his left and goes 5 km. Now how far is he from his house and in what direction? From third position it is clear he is 4 km from his house and is in North direction. Rakesh starting from his house, goes 4 km in the East, then he turns to his right and goes 3 km. What minimum distance will be covered by him to come back to his house? One morning after sunrise Juhi while going to school met Lalli at Boring road crossing. Lalli's shadow was exactly to the right of Juhi. If they were face to face, which direction was Juhi facing? Solution: In the morning sunrises in the east. So in morning the shadow falls towards the west. Now Lalli's shadow falls to the right of the Juhi. Hence Juhi is facing South. 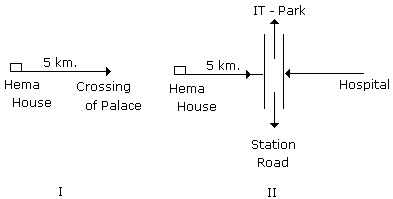 Surabhi starting from her house walked 5 km to reach the crossing of Palace. In which direction she was going, a road opposite to this direction goes to Hospital. The road to the right goes to station. If the road which goes to station is just opposite to the road which IT-Park, then in which direction to Surabhi is the road which goes to IT-Park? From II it is clear that the road which goes to IT-Park is left to Surabhi.